PlanetShoes and Naot have generously contributed $20,000 worth of shoes to the much-deserving Women’s Lunch Place, a wonderful women’s shelter in Boston. 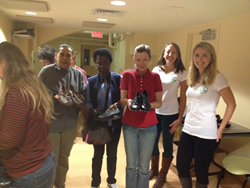 “For the past three years, it has been such a pleasure working with the Women’s Lunch Place and Naot to give some amazing shoes to the hard-working women of Boston," said Phil Meynard, President of Planet, Inc.
On September 25, 2014, PlanetShoes and Naot partnered for the third year in a row to bring 150 pairs of quality, comfortable shoes to the women at Women’s Lunch Place, an incredibly helpful shelter in the heart of downtown Boston. Working to help those women plagued by homelessness and poverty, the Women’s Lunch Place helps preserve the dignity of these women through community dining, employment assistance and advocacy. “For the past three years, it has been such a pleasure working with the Women’s Lunch Place and Naot to give some amazing shoes to the hard-working women of Boston. Naot’s generosity, coupled with the impressive services and attitude of the Women’s Lunch Place, makes this one of our favorite events of the year. PlanetShoes is proud to offer a helping hand to such a strong community of delightful women,” stated Phil Meynard, President of PlanetShoes. PlanetShoes.com is a lifestyle retailer committed to carrying a large assortment of distinctive, hard-to-find shoes, boots, bags and accessories that blend style, comfort and value. Going beyond the traditional shopping experience to help visitors explore and discover brands that matter, PlanetShoes translates the experience of boutique shopping to the online realm. From vegan to eco, trends to health and wellness, Made in Europe to Made in the USA, PlanetShoes has wide selection of products from over 200 brands for each and every lifestyle. For more information, please visit planetshoes.com. Yaleet Inc. – the U.S. Distributor of Naot Footwear, believes that all people should have the opportunity to live comfortably and look stylish. This is one of the countless reasons behind its drive, with the help of retailers and local charities to fit as many people as possible around the nation with Naot Footwear. There are few feelings as good as helping a less fortunate person experience the happiness of putting on a brand new comfortable shoe, and the company strives to accomplish this with every donation it takes part in. Every year Yaleet Inc. donates approximately 15,000 pairs of Naot shoes and sandals to local charities, with the hope that this little addition to these people’s lives will bring joy and happiness one step at a time. Women’s Lunch Place has been serving women experiencing homelessness and poverty in Boston for more than 30 years. It is one of the few places where women in need can find safety, comfort, and sustenance during the day. Located in Boston’s Back Bay—and with volunteers from Greater Boston and beyond—Women’s Lunch Place is a caring community that provides nutritious breakfast and lunch, along with education, social programs, and general support.